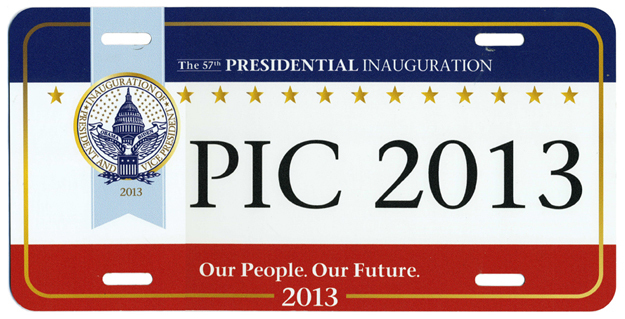 Two plate styles, both flat aluminum, 6" x 12"
The second inauguration of Pres. 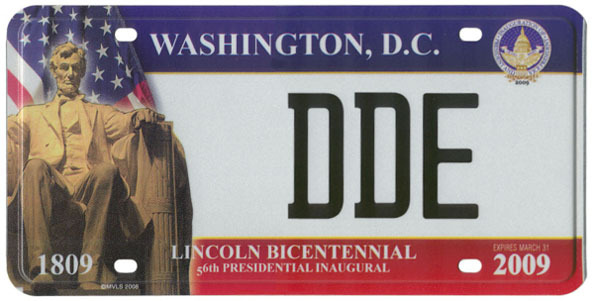 George W. Bush represents two landmarks in the history of Presidential Inaugural plates. First, two styles of plates were produced, by two separate companies; and second, from the standpoint of the general public these special-event plates were souvenirs only. In fact, this was the first time in more than 50 years that Inaugural plates could not be registered for short-term use on privately-owned vehicles. 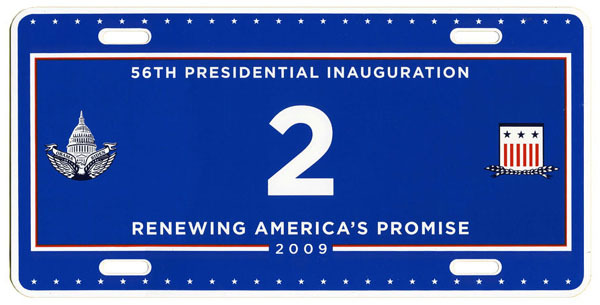 Plates of both styles offered in 2005 are aluminum covered with graphic reflective sheeting, and are completely flat except for a debossed edge. 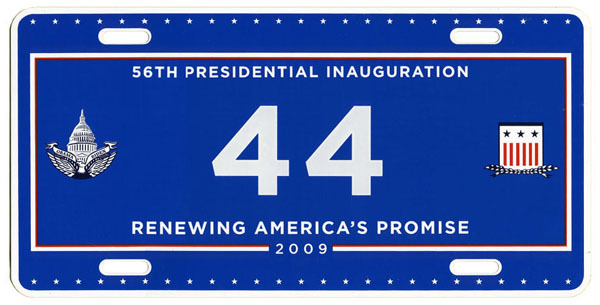 The more traditional-looking of the two designs was marketed by GOP Shoppe under a contract with the 2005 Presidential Inaugural Committee, and was offered on the company's Web site, GOPshoppe.com. The flat plates feature a stylized American flag across the top and, on a blue band across the bottom, the legend Celebrating Freedom - Honoring Service in fine, white script lettering above 55TH PRESIDENTIAL INAUGURAL printed in more bold lettering. 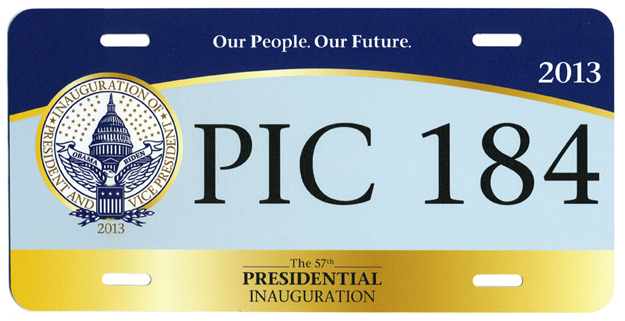 The Inaugural seal appears to the left of the registration number, which is printed in blue. Plates of this design were offered to the public in general-issue and personalized form, and were issued in pairs. General-issue plates were numbered sequentially beginning at 002006 and cost $35 per set, whereas personalized plates could be ordered with up to six characters for $50 per set. On Jan. 7, 2005, the D.C. Dept. of Motor Vehicles announced that plates of this design could be displayed on the front of properly registered vehicles in lieu of the assigned D.C. plate. There is no motorcycle version of this plate. 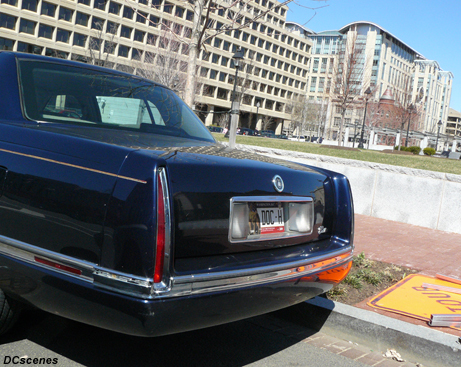 As for their use in an official capacity, plates of the GOP Shoppe design were displayed on limousines used by the president and vice president, as well as on U.S. Secret Service vehicles that accompanied them. Two private companies were behind the second 2005 offering, which was offered in both a full-size and motorcycle plate version. The distinctive deep blue plate with an image of the Capitol was designed and marketed by Hunter International Co., of Arlington, Va., and manufactured by Motor Vehicle License Systems, of Laguna Hills, Cal. In addition to being offered to the public as souvenirs, these plates were used on motorcycles operated by the Metropolitan Police Dept. and U.S. Park Police that led the inaugural parade, as well as on other official vehicles in the parade. Pairs of the Hunter/MVLS plates were available for $50, and could be personalized with up to seven characters. Numbers below 1500 were not available to the general public. Vice Pres. Joseph R. Biden, Jr. Although from the standpoint of Presidential Inaugural plates the inauguration of 2009 was similar in many respects to that of 2005, there is one very significant difference: examples of one of the two distinct plate designs were not made available to the general public, but rather were used only on Presidential and Vice Presidential vehicles as well as accompanying vehicles of the U.S. Secret Service. 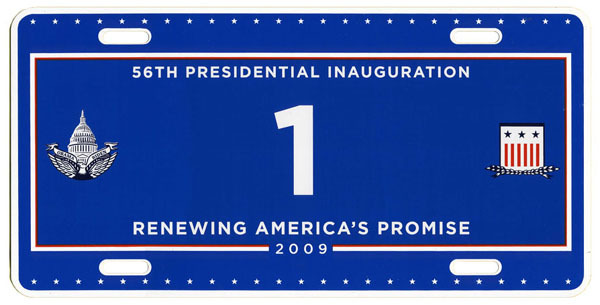 The first 2009 design was produced upon direction of the Presidential Inaugural Committee and includes the slogan Renewing America's Promise at the bottom. 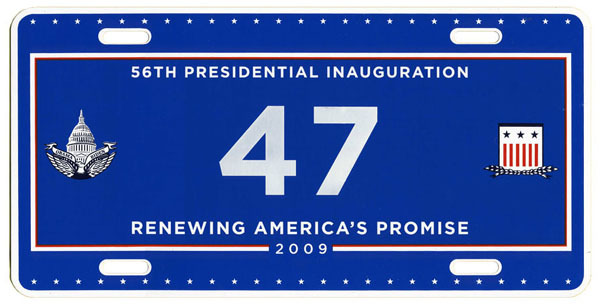 These flat, white-on-blue aluminum plates were made for use exclusively on a limited number of official vehicles involved in inaugural activities. Specifically, plates marked as indicated in the table below were produced, and although the number of plates made with each registration combination is unknown, the Committee has indicated that all were made in very small quantities. There is no motorcycle version of this plate. President-Elect Obama's limousine and accompanying U.S. Secret Service vehicles on Sun., Jan. 18 and Mon., Jan. 19. Number commemorates that the President Elect is to serve as the nation's 44th president. Vice President-Elect Biden's limousine and accompanying U.S. Secret Service vehicles on Sun., Jan. 18 and Mon., Jan. 19. Number commemorates that the Vice President Elect is to serve as the nation's 47th vice president. Limousine and accompanying U.S. Secret Service vehicles that transported President Bush and President-Elect Obama from The White House to the U.S. Capitol on Tue., Jan. 20. Number used due to the car being occupied by the president. Limousine and accompanying U.S. Secret Service vehicles that transported Vice President Cheney and Vice President-Elect Biden from The White House to the U.S. Capitol on Tue., Jan. 20. Number used due to the car being occupied by the vice president. Limousine and accompanying U.S. Secret Service vehicles that transported President Obama and his family in the Inaugural parade on Tue., Jan. 20. Limousine and accompanying U.S. Secret Service vehicles that transported Vice President Biden and his family in the Inaugural parade on Tue., Jan. 20. The second 2009 design was created and marketed by Hunter International Co. and produced by Motor Vehicle License Systems (MVLS), continuing their 2005 partnership. It prominently features an image of the Lincoln Memorial statue of Pres. Abraham Lincoln, commemorating the 200th anniversary of the birth of the Great Emancipator. These plates are flat with a debossed edge, and examples were widely marketed prior to inauguration day. Also like 2005, the Hunter/MVLS plate could not legally be used on motor vehicles, but rather was offered only as a souvenir. The flat plates were manufactured and sold in pairs, and all sold to the general public (i.e. all except those specially made for use during the inauguration) are personalized with up to five characters, printed in black. Their cost was $50 per set. 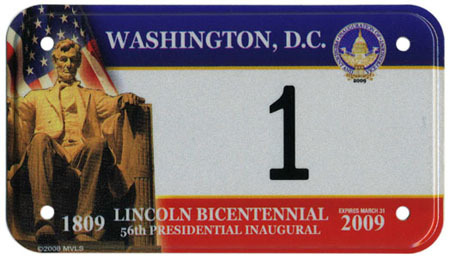 In addition to being made available as souvenirs, full-size and motorcycle plates of this design, all of which feature the inaugural seal in the upper right corner and LINCOLN BICENTENNIAL - 56th PRESIDENTIAL INAUGURAL at the bottom, were used on official vehicles involved in the inauguration. As discussed below, however, plates of the Hunter/MVLS design were not used on vehicles in which the new president and vice president were transported during public events. Specially-marked plates of the 2009 Hunter/MVLS design were made available to members of a variety of groups and not-for-profit organizations, which are listed below. Each includes the organization's name on a second line across the top of the plate. Several of the not-for-profit organizations also participate in the District's Organizational Plate Program. Special plates marked PARADE VEHICLE were also made, as were plates for the presidential and vice presidential limousines that include the official seals of those offices. Those who experienced the inaugural parade in Washington or viewed it on television, however, know that the white-on-blue Presidential Inaugural Committee plates discussed above, not a variety of the Hunter/MVLS design, were displayed on official vehicles of the new president and vice president. 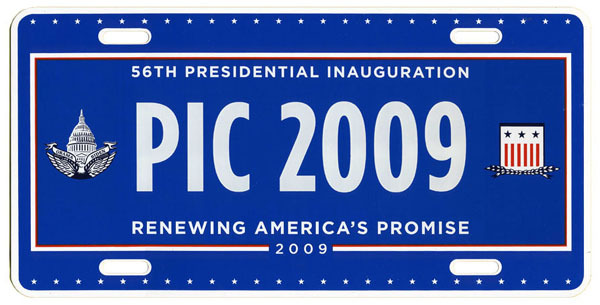 The inaugural license plate program of 2013 was similar in many respects to that of 2009, most notably that there were separate designs prepared by the Presidential Inaugural Committee (PIC) and a private concern, a partnership between Hunter International Corp. and Motor Vehicle License Systems (HIC/MVLS). As in 2009, official PIC plates were closely controlled and not available to the general public whereas the HIC/MVLS design was offered for general sale but only as a souvenir, not for use on motor vehicles. There were two PIC designs this year, not just one as in 2009, and all three styles of 2013 inaugural plates qualify as true presidential inaugural plates because they were used in official capacities during inaugural events. After spending considerable time reviewing different proposed designs for inaugural license plates to be procured and controlled exclusively by the inaugural committee, its members settled on two rather different designs. One uses a traditional red, white, and blue color scheme whereas the other is gold and two shades of blue, a combination inspired by the livery of Air Force One. Examples of both are painted (which is to say they do not have a reflective background), completely flat aluminum. Plates of both PIC designs were produced solely for use on official vehicles. None were made available to the public. As occurred in previous inaugural years more than a single pair of plates numbered 1 and 2 were made, although the exact quantities are unknown. Extra plates with other numbers are also known to have been produced. The inaugural committee has not revealed how many sets of plates with various numbers were made but the quantities are small, making these plates difficult for collectors to obtain. One of the PIC designs features a white background with wide horizontal bands of dark blue and red across the top and bottom, respectively. It is this design that was used for the traditional no. 1 and no. 2 plates made for display on the presidential and vice presidential limousines during the inaugural parade, although these two symbolic plate numbers were in fact not used in these capacities this year. Why this occurred is addressed on a separate page; click here to reach it. Plates of this design marked PIC 2013 did, however, appear on officials vehicles used during the parade, such as those in which inaugural committee members rode and on float tow vehicles, and examples were also specially made with personalized combinations for individuals associated with the inaugural committee. The second PIC design features a light blue background with a gold band across the bottom and dark blue panel at the top. Numbers on these plates are PIC 101 through PIC 201. They were used on vehicles leased to the inaugural committee for the transportation of dignitaries during a variety of events, and when their service had ended one plate of the pair was given to the vehicle’s driver and the other was retained by the committee. For the third consecutive inauguration a commemorative license plate with digitally-printed registration number characters and a fully graphic background was offered through a joint venture of Hunter International Corp. and Motor Vehicle License Systems. Although they could not be used on privately-owned vehicles, an expiration date legend, “Expires March 31, 2013,” is printed in small lettering in the lower right corner. Plates of this design were all made with specially-ordered combinations, which is to say there was not a batch of sequentially numbered plates that were randomly distributed. Each set of these colorful plates cost $50 and the maximum number of characters permitted was five. 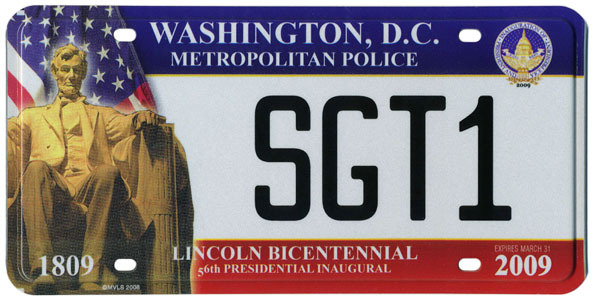 Full-size and motorcycle plates of this design were available, and most Hunter/MVLS plates used during the inauguration were cycle plates displayed on vehicles of law enforcement agencies. For example, those operated by the Capitol Police are numbered beginning with CP, such as CP-12. As in 2009, customized plates were made for a number of organizations such as Delta Sigma Theta Sorority, Omega Psi Phi Fraternity, Bad Boys Club America, Corvette Fun Company, and the D.C. City Council, all of which were made in the full-size format only. Full-size plates with the international access (wheelchair) symbol were also made. Plates made especially for the U.S. Park Police and Metropolitan Police were made in both full-size and motorcycle formats. 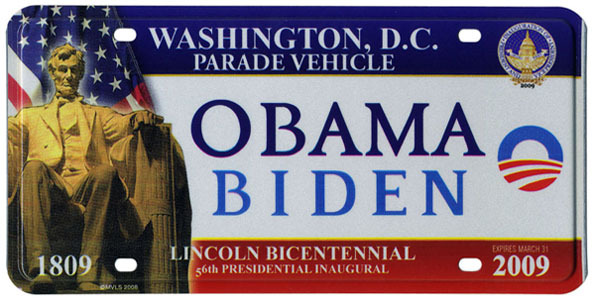 Special full-size Parade Vehicle plates with OBAMA and BIDEN printed across the center in place of a registration number were also made. 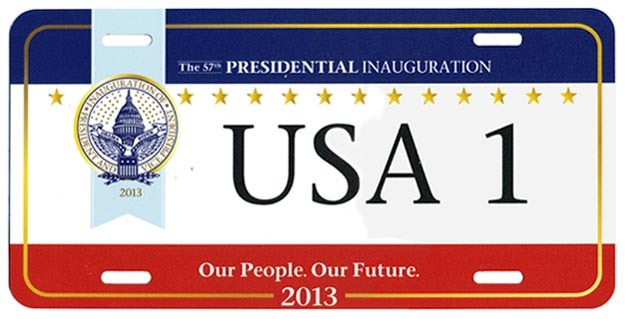 flat aluminum, 6" x 12"
Souvenir license plates of two designs were offered to the public during the 2017 inaugural season but only one, offered by Motor Vehicle License Systems (MVLS), is known to have been used in official inaugural activities and therefore qualifies as a presidential inaugural license plate for our purposes. Neither of these souvenirs was valid for use on motor vehicles except for when the MVLS design was used in conjunction with official inaugural activities. As of January 11, 2017, no announcement about the use of special inaugural license plates had been made by the Presidential Inaugural Committee, and a Wall St. Journal article published two days later indicated that plates would not be made. Nevertheless, the committee announced just two days before Inauguration Day that it was considering the use of special license plates. 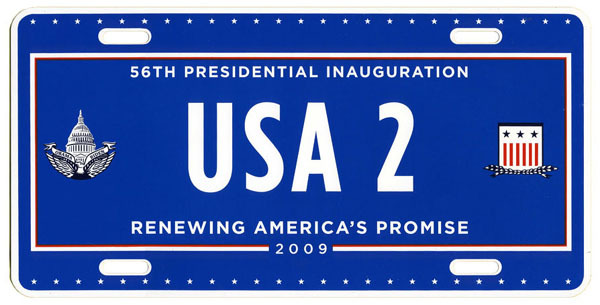 After President Trump had been sworn into office his limousine and that of Vice President Pence were marked with plates numbered 1 and 2, respectively, in the design pictured above. An article in the April 2017 issue of PLATES Magazine indicates that other vehicles in the inaugural parade, such as motorcycles of the U.S. Park Police and Metropolitan Police Dept., also had plates of this design. 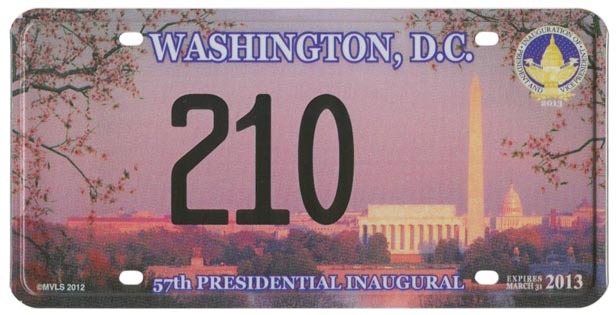 The 2017 commemorative inaugural license plate features digitally-printed registration number characters and a fully graphic background. As in the past three inaugurals, it was offered through a joint venture of Hunter International Corp. and Motor Vehicle License Systems. Although they could not be used on privately-owned vehicles, an expiration date legend, “Expires March 31, 2017,” is printed in the upper right corner. As with past issues, plates of this design were all made with specially-ordered combinations, which is to say there was not a batch of sequentially numbered plates that were randomly distributed. Each set cost $50 and the maximum number of characters permitted was five. 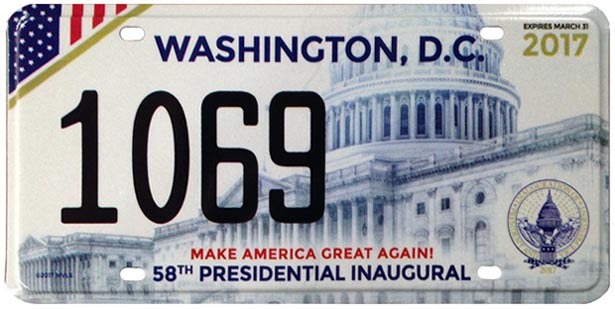 Most of the information and images on this page were provided by Charlie Gauthier, an expert on the subject of Presidential Inaugural license plate history. Mr. Gauthier has published a number of articles on the subject and has, over a period of decades, carefully built and maintained the most complete collection of inaugural plates and ephemera. As a District of Columbia native who now resides in Northern Virginia, he has worked directly with a number of past inaugural committees on their commemorative license plate programs. DCplates.com is sincerely grateful for his willingness to share his collection and knowledge through this page. For more information about these plates or to provide more information about or images of them, please send an e-mail to Mr. Gauthier at Charlie@DCplates.com.